It is fitting that on the Centennial of the National Park Service the Print of the Month be devoted to the magnificent Yellowstone River and Yellowstone National Park. As America’s first National Park, and indeed widely held to be the first national park in the world, Yellowstone’s designation as such was signed into law on March 1, 1872 by then President Ulysses S. Grant. Spanning an area of some 3,468 square miles, the Park is known for its varied ecosystems, abundant wildlife and many geothermal features, especially Old Faithful Geyser. Although Native Americans inhabited the high plateau of the “Yellowstone” area (likely named for the yellow rocks and obsidian used to make projectile points) for thousands of years, organized exploration (other than “mountain men”) of the region did not get seriously underway until the 1860’s though Lewis and Clark had heard tales of a region of “fire and brimstone” during their expedition across the Continent in 1804. The high plateau (8000 feet) of the “Yellowstone” surrounded by mountains is actually the Caldera of a still active mammoth and ancient “supervolcano” whose cataclysmic eruption 640,000 years ago ejected more than 240 cubic miles of ash, rock and pyroplastic materials. This eruption was 1,000 times large than the 1980 eruption of Mount St. Helens. Yellowstone Lake, the jewel of the Park, resides toward the center of the Caldera. The Yellowstone River, whose beauty is unsurpassed, begins on the slopes of the Absaroka Mountains southeast of the Park, feeds Yellowstone Lake and subsequently runs some 671 miles finally joining the Missouri River near the Montana-North Dakota Border. 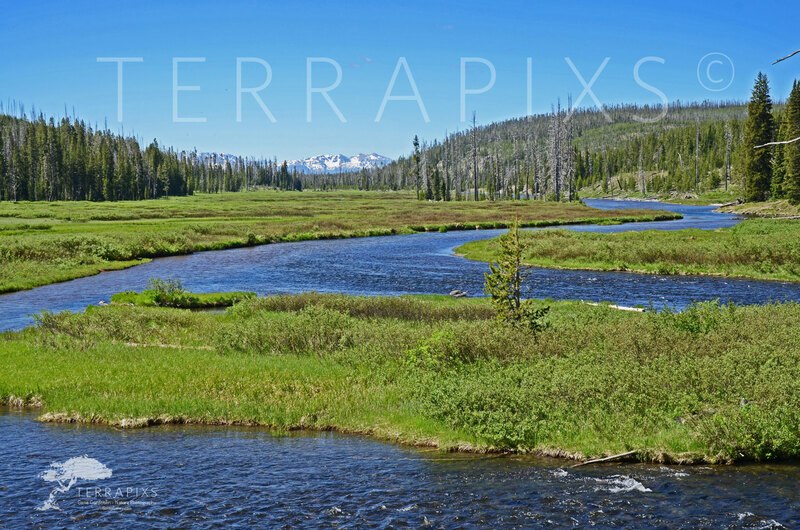 It is the longest undammed river in the United States and is a prized trout fishery known around the world. So in this summer of the National Park Service Centennial, if at all possible, do take the time to visit Yellowstone, our first National Park, and bask in its grandeur. Happy Trails!